Artist: A person who produces works in any of the arts that are primarily subject to aesthetic criteria. Journey: A travelling from one place to another, usually taking rather a long time..
With this in mind I think it is fair to say art is a journey, with an artist’s skill changing and developing over the years to create a style that is personal to the artist. I also feel it is acceptable to say that an artist has something in their genes or brain that makes them exceptional in the creation of visual arts. This something is what actually encourages and influences an artistic person when they are making choices. It dictates subjects they choose throughout their education and the direction their career takes. These decisions result in an artist’s personal journey during which they explore, evolve and transform their techniques and ability to develop their own individual style. Lifestyle may control the direction the journey takes but the “something” will dictate art will always be an underlying factor. Be that as a hobby or one way or another as an occupation. As one of those artistic persons with that something in my genes or my brain, here is an insight into my artistic journey. I know not what the “something” is, or whether it is in the genes or the brain, but I do know how it feels. Its effect may not always be there, but it never goes away. From a young age I liked to draw and paint. However, there were times when my interest would wane for a while and during these periods it was not so easy to create artworks. Then suddenly I would feel the urge to draw and paint, creating art then just seemed so easy. People would comment “he is like his dad, a natural artist”. It did not really mean anything to me at the time, but I guess this was an early indication of the “something” and its natural born influences that would dictate my journey. Another indication of the “something” that became apparent as I got older was the ability to see pictures in my mind. My mind creates images I can see and then I craft these into pieces of art. Some people are good with figures, others with words, but my mind works naturally in pictures. natural beauty is a “cliché”. However, landscape vistas have a special appeal to me and the “something” generates a passion to utilise my artistic voice. In my mind uninspiring locations can be transformed into meaningful images that provide inspiration for me to paint and communicate with the viewer. Discovering who you are as an artist is an ever evolving journey of self-discovery that can be lonely and frustrating. As an infant I had no knowledge of having any artistic ability, just a naïve desire to draw and paint. Whatever was the focus of my interest at the time would become the subject for my artwork. My earliest memory of being fully absorbed in a piece of art was in 1969 at the age of eight at St Johns Primary School, Dukinfield. We were asked to produce a painting relating to the Apollo 11 moon landing which had just taken place. I remember humming the television music (“Also sprach zarathustra” by Richard Straus) as I was totally absorbed in producing the painting. Sadly, this work did not survive to the present day. 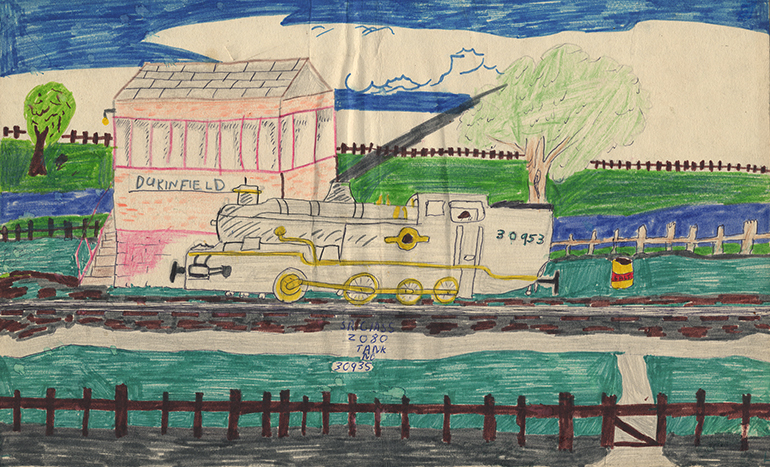 However, the earliest piece of work I still have is the train picture shown which I produced at the age of ten. This picture was stapled on the front wall of our classroom. Which incidentally doubled as the school assembly hall each morning. The picture was on view to the whole school, and I felt proud as punch thinking that’s my picture there on the wall. Aged eleven I attended West Hill Secondary School in Stalybridge. Throughout secondary school my grades were always acceptable but I was always outstanding at sports and art. In my third year at the school I excelled in Geography pure and simply because my interest was captured studying how landscapes were created, and because we had to draw illustrations to describe this, perhaps an indication of where to find my true artistic inspiration. In the art room I was fortunate to be tutored by Owen Traynor who became a well-known local artist, he taught me the fundamentals and developed my basic artistic skills. I was beginning to be expressive in my drawing and painting introducing ideas into the academic pieces of work I produced. This probably had a bearing in me deciding the art world in one form or another was where my future lay. The focus of my last two years at West Hill School were devoted to preparing work for my CSE and GCSE art examinations. Unfortunately, the weekend before the first part of my GCSE art exam (Life Drawing) I sustained a sporting injury dislocating and breaking my right wrist, I underwent an operation to correct the injury and missed the examination. With my arm in a plaster cast which I carved to ensure I could at least hold a pencil I sat the second part of the exam producing a painting called “A Sea of Litter”. Due to missing the first part of the examination I could only gain a Grade C qualification which I did manage to achieve, but not the Grade A that I desired. I did achieve Grade 1 in my CSE examination but I did feel this was little compensation. The piece shown was my examination piece created for our third year class exam. The portfolio for my artwork I had prepared at school for my college interview was successful, and I was offered a place at Tameside College of Technology in Ashton U Lyne, Lancashire. Attending college to study advertising design meant I was progressing along my artistic path and continuing my education in drawing and painting, as well as learning about graphic design and other disciplines. My end of term report confirmed I was on the right track comments like “one of our best students, but must not rest on his laurels” and “An excellent start to the course, excellent potential” indicating my enjoyment and commitment to the course was reflected in my work. However, the stupidity of youth was about to strike. In the summer break I got a part time job that provided money that enabled me to join my friend socialising in the evenings and at weekend. Frankly, in hindsight and maturity my decision to pursue work and leave college was ridiculous, especially as it was to start employment as an apprentice car body repairer. What was I thinking? It is certainly one of the decisions in my life I have lived to regret. The image to the left shows examples of some of my college work. Having strayed from my artistic path it was not long, two months to be precise, before the artist in me became restless. A trip to the Jobcentre saw me change direction back to my artistic path. At this time it mattered not what the nature of the artistic connection was, I just wanted to be involved in a job that was art related. Beginning as a junior in the drawing office at Astley Signs in Ashton U Lyne enabled me to utilise my drawing and illustration skills to produce manufacturing and design drawings. After around twelve months due to the retirement of my senior I was offered the opportunity to manage the department, and for the next few years I oversaw all aspects of the department incorporating production and design. As my personal circumstances changed and I had responsibilities to provide for my artistic journey became second best to the need to provide for my family. It therefore became prudent to follow another path moving into contract management and then into various sales positions. Invariably using my drawing and design skills to present information, deliver presentations and design marketing support material. Examples of the artwork I produced can be seen to the left. Though I had utilised my artistic talents whenever I could the artistic bug inside had never been satisfied. The bug kept nagging and finally when the circumstances were right my artistic voice began to sing. Firstly drawing and then painting images based around my hobbies. Whilst visiting a major art exhibition with my wife Sylvia, she confirmed to me when asked that my paintings would not look out of place in the exhibition. This encouraged me and I prepared a number of works to enter into The British Watercolour Society exhibition in Ilkey, West Yorkshire. At the exhibition I was awarded the Mail on Sunday Sponsors Prize, further awards and prizes followed and sales of my original paintings and prints became a regular occurrence to art lovers far and wide. As my work grew more popular I felt the need to have a base to work from, against advice that Though I had utilised my artistic talents whenever I could the artistic bug inside had never been satisfied. Life often interferes and does not always cooperate in enabling us to achieve what we desire. However, we roll with it and often find the seed to an opportunity with a greater benefit. Due to the gallery commitments I started to produce paintings using the medium of pastel, I found with this medium I can better capture and express the mood and atmosphere I wish to visualize. This led me to start painting in oils and with equal measures of enthusiasm and fear this has now become my medium of choice. Incidentally enthusiasm and fear are the strange mix of emotions that come into play in nearly every stage in the production of a painting. I had worked seriously with the watercolour medium for a number of years but in all honesty I had found this to be restrictive to what I personally was trying to achieve. My main medium of choice has now become oil paint. Each medium I have used has strengthened my abilities but pastel and oil allow me to express light, shadow and natures beauty to match my artistic vision. Having tried different mediums and explored different styles, methods and techniques to find myself as an artist and painter is an ever evolving journey, which can be frustrating. Confidence ebbs and flows from piece to piece, being encouraged when my work satisfies me and disappointed when my confidence wains. Fortunately that something I discussed earlier has the ability to keep me trying. With maturity has come patience, perspective and finally I feel my artistic journey is natural and has direction. It has been a topsy turvy ride and I am sure there will be further twists and turns, and ups and downs. My painting creates the reason and desire to go to places that I would otherwise not make the effort to visit. 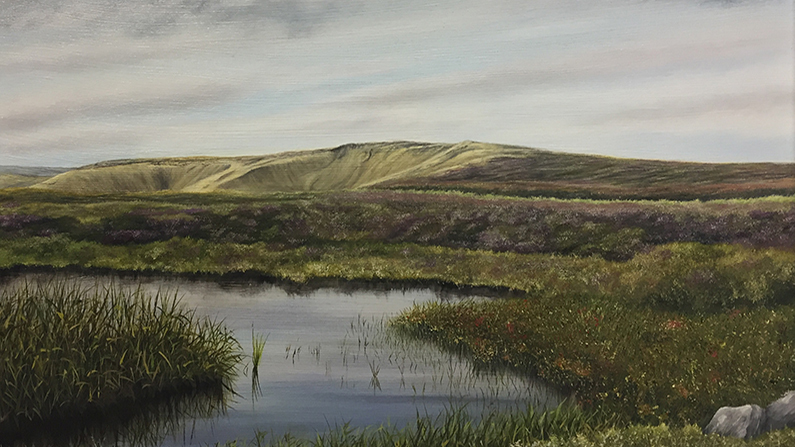 In my paintings I will endeavour to portray my passion for the landscape, whilst creating interesting plays of light shadow and natural beauty. The artistic road of development and self-discovery is what it is and I must focus on the journey. The journey continues I hope you all stay along for the ride …….